Balize Cemetery (Historical) Mouth of Miss. 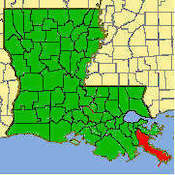 Hurricane Katrina destroyed much of Plaquemines Parish on August 31, 2005. Many communities remain underwater after the disaster. Many were killed. Cemeteries may be lost forever. Our hopes and prayers are with those who lost loved ones and homes in Plaquemines Parish.